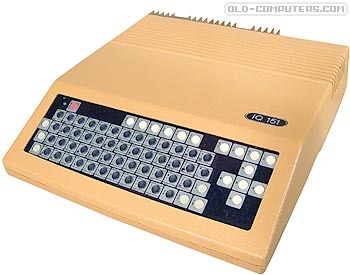 The IQ-151 was a Czechoslovakian home computer manufactured by ZPA Novy Bor (Novy Bor being the town where ZPA was based). It was mainly intended for educational purpose and was actually supplied to all types of Czech schools. We were using IQ 151 in the school. Its keyboard was probably the worst keyboard ever invented (at least I cannot imagine worse keyboard) and it was very difficult to type. The computer produced lots of heat (people say that they put coffee cup on it to keep their drink warm). Hardware was VERY unreliable, often there were half of the computers in our school out of order. It was used widely in Czechoslovak schools together with Tesla PMD-85 which was better and more reliable but were hardly available. We had this monster in school too. It had different graphics and text pages, so until you dont reset graphics, it was over the text you typed. Bad, bad computer. It produced A LOT of heat, when it was rainy day and some people came to school in wet clothes, put them on the back of this metal monster to dry it. It had a primitive sound system, mono. Keyboard was membrane type, so after long using membrane was almost unable to use. The case was from real honest cast iron. Standard language was a clone of Basic. PERIPHERALS CONSUL 2112 or 2113, MINIGRAF 0507 (Aritma), SESTYK (teleprinter connection), printer, tape-recorder TESLA M710A or K-10 (external memory), Basic G, VIDEO , TAPER external module (printer connection), GRAFIK external module (256x512). see more ZPA IQ-151 Ebay auctions !